The JOCCA Facial Cleansing Brush features two speed for basic sonic cleansing and deep clenasing. With this Facial Cleansing Brush you will get a perfect and smooth skin ready to make the product treatment or make-up application. Includes 4 different disks and a practical travel case to keep it safe when not in use. With this Facial Cleansing Brush you can have 4 different functions in only one device: exfoliant, revitalising, massager and cleansing. Get a perfect skin with JOCCA. 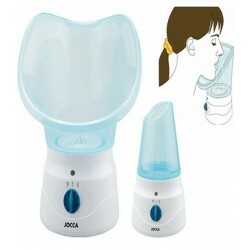 Pamper yourself with the unique JOCCA Facial Steamer and relax in the comfort of your home. Two different settings for the intensity of the steam, it includes a removable ergonomic mask. 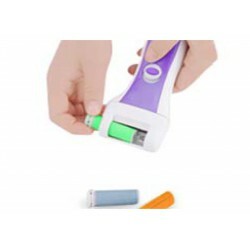 The JOCCA Facial Steamer also includes an inhaler to clean the respiratory tract. Perfect for children and flu seasons. Gentle enough to be used daily, the JOCCA Hard Skin Remover buffs away hard, rough and dry skin in seconds. Enjoy really smooth feet any time during the year with the fabulous JOCCA Callus and Hard Skin Remover. SET DE 4 RODILLOS PARA RODILLO ELÉCTRICO DE PEDICURA . Recambio del quitadurezas eléctrico JOCCA. Cuida tus pies al máximo.